This is a continuing post where I celebrate the best and most influential video games of my lifetime as my increasingly “adult” schedule (boo) makes it harder to play them as much as I want to. Click here for number 10. This game originally came out on the Sega Saturn, but I never had one, so I didn’t even know this game existed until my wife brought her Game Cube games into our marriage (I married a winner). The GC “Legends” version is very, very similar, however. If you haven’t heard of this game, it’s about adventure, and MAN do they make it work! You’re a ragtag team of sky pirates flying between floating continents, exploring the realms of the six moons and the powers they each bestow, and fighting off an increasingly interesting set of bad guys. In the main story alone, you fly higher and lower than anybody else, find lost civilizations, discover the world is round, and punch your way through a black hole. And that’s not including the side quests! So the game is one big unfolding adventure both in plot and gameplay. You start on a small island and slowly fill out the world and have a hundred and one adventures. It’s like The Legend of Zelda: Windwaker except without all the fluff (zing!). The story is long, but full of meat, so it’s not boring or forced, and that makes for hours and hours of fun. So why isn’t this game higher on the list? Well, the gameplay does move a little slower than I usually like and while the plot is good, it’s an investment, so you can’t just pick it up any time like Number 10. 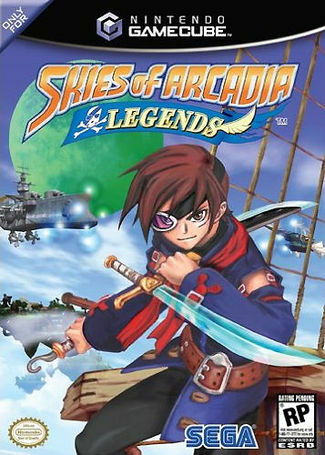 Still, Skies of Arcadia: Legends is a great game with some colorful animation, a lot of fun exploration, and even some good humor. It’s only number 9 because the other games on this list are better. Just you wait! QUESTION: Did anybody else like this game?